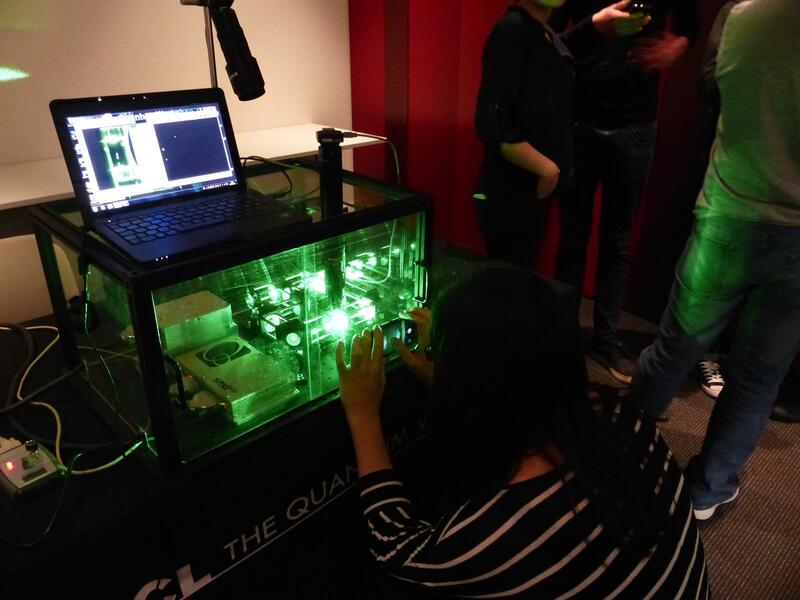 James gave a talk at the Institute of Physics on March 10th 2015 to the public and IOP staff, making full use of the glowing green loveliness of TQW. It was a long, long, rambling talk. James took the Quantum Workshop along on the 25th Feb 2015 to give a frankly bonkers talk to a bunch of artists from the Royal College of Art who were doing a module on representing quantum physics through art. Cue hand-waving and gratuitous use of Bernice Abbott. 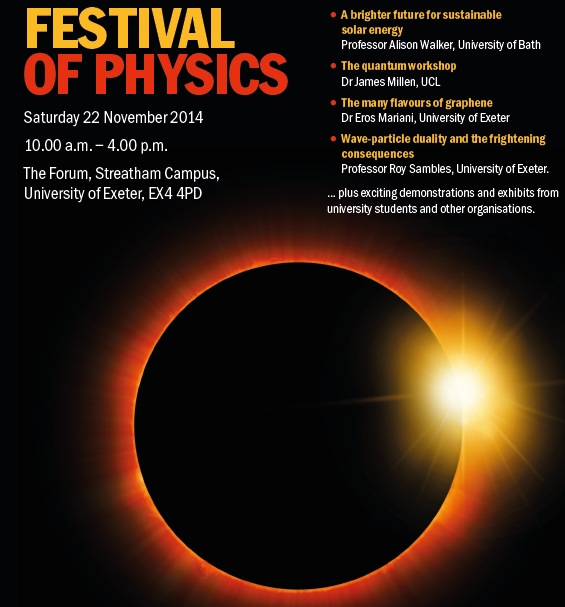 James and Lia got in the car once again and appeared at the IOP Festival of Physics in Exeter on the 22nd November 2014. James also gave a lecture to a huge audience! TQW gave a talk at the Alchemist Cafe in Dublin on the 23rd July 2014. TQW did a SciBar on 12th September at 7pm at The Lamb pub, Lamb’s Conduit Street in London for Science London. James and Lia gave a double headed talk of wonder, where we discussed the relatives merits of teleporting Justin Beiber AWAY. It was the most incredible night, packed, people sat on the floor up to our feet, queues out of the door, over an hour of Q&A. 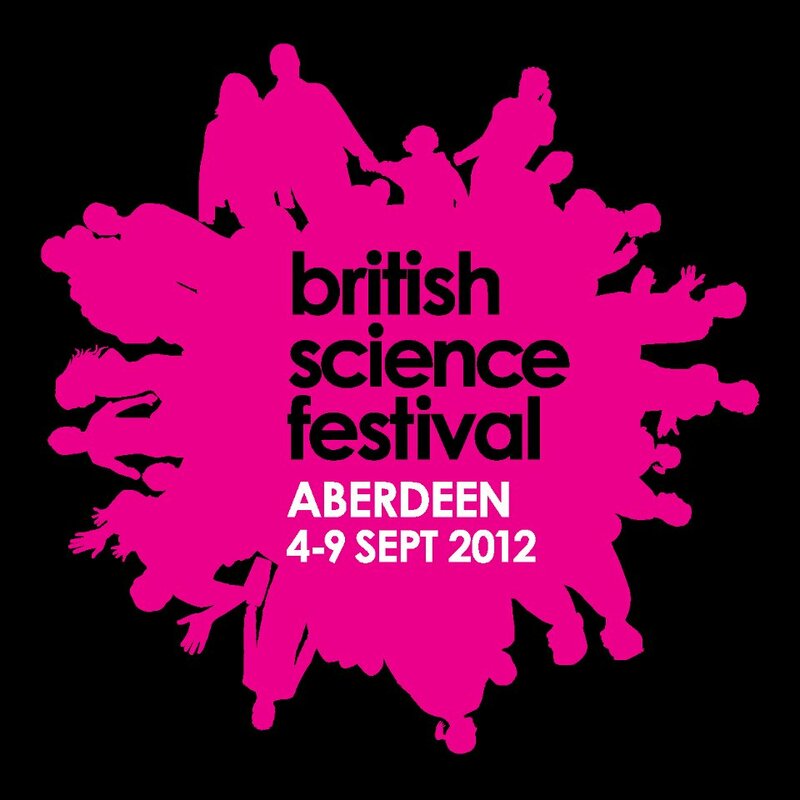 TQW were at the British Science Festival on the weekend of 8-9th September 2012. Laser levitation still worked that far North! It is hard to put into words how terrified and excited we were about this event: TQW set up stall at Spitalfields Market on Sunday September 2nd. Just on a market day. Lasers. Thanks to our volunteers: Fern, Bobby, Susan, Roman, Alessio, Daniel, Seto and Pete. When James and Lia started TQW it was with this event in mind, so we were giddy with excitement to do a Science Museum Lates on Wednesday August 29th. It was super busy and successful. Thanks to our volunteers Arne, Pete, Duncan, Daniel and Hussain. We rocked out in Cardiff on July 14-15th. TQW overheard people grumbing that they should have taken Physics A Level. SUCCESS. 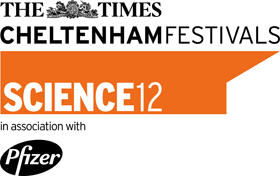 We had an amazing time at the Times Cheltenham Science Festival on the 15th of June! We were presenting in the adults only Area 42, and assisted by Dr. Matty Hoban and Dr. Janet Anders. We will be giving an interactive lecture in Bristol on the 16th March between 1-2pm. This is a lunchtime lecture is part of Pervasive Media’s Open Studio Friday events. For more information please see here: Lunchtime Talk: The Quantum Workshop – Why isn’t the world more weird?. This event was blogged about here:Pervasive Media blog. Our first event will take place on Saturday 3rd March in Oxford, as part of the launch event for the Oxfordshire Science Festival: Science in Your World. Come and see our levitated microspheres between 10am – 4pm outside the Westgate Centre in the centre of Oxford. 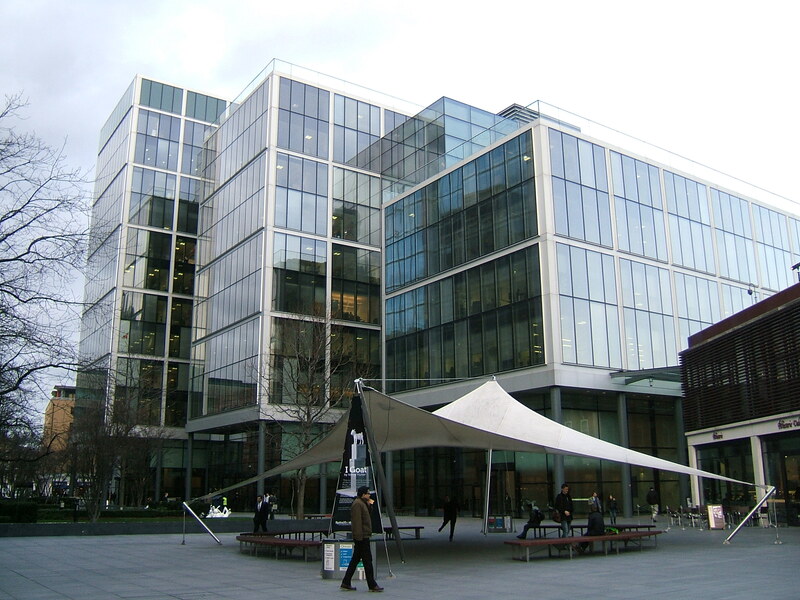 James is giving a guest lecture for the Lasers and Modern Optics course at UCL on 2nd March. This is the very first time The Quantum Workshop will escape the basement! 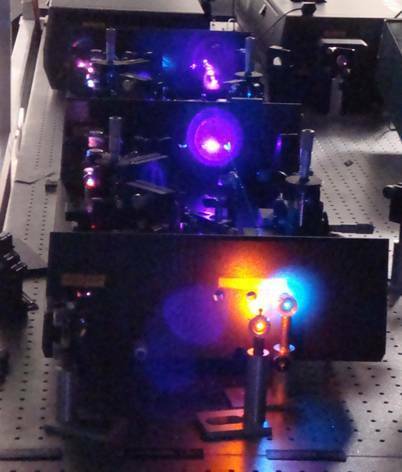 Expect chat on laser cooling, and nice pictures. Thanks for the demo at Spitalfields and the discussion – you’re all very friendly and patient! Good luck with the research, and why don’t you bring your stuff over to http://www.scienceshowoff.org/ ? Good to chat to you Liam! Sorry to see that there was some confusion about our location. 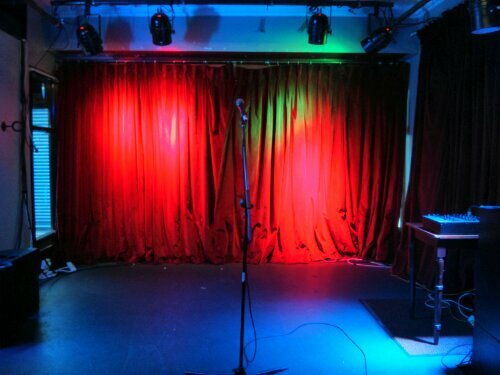 We’re talking at The Lamb on Lamb’s Conduit Street at 7pm today (12th Sept), free entry, if you’re interested? I would! But I’m in Greenwich. Have a good session and blind them (with science)!